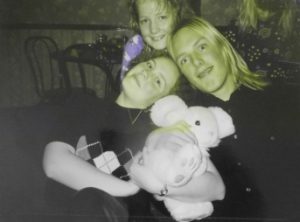 A little over a third of my life ago, when things were very different, I was dating a girl who had an unusual approach to horoscopes. During the period that we lived together, each morning, I’d see her perform a peculiar dance (at the time, I thought that it was things like this that defined her particular insanity: later, I learned better). Trying to date this photo? Those kids in the background are my sisters. 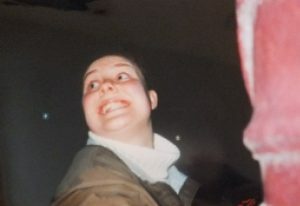 Given my description of her in this blog post, this crazy-face-picture might be a more-fitting photo of my ex-. At the time, I mocked her for it. But over time, I’ve come to see that “choosing your own horoscope” is no less-insane, and perhaps a little saner, than believing in the power of horoscopes to begin with. To argue against her behaviour on the grounds that she’s choosing a horoscope rather than using the ‘correct’ one, one must first accept the legitimacy of the process of assigning people personality characteristics based on the relative positions of the Earth, Sun and distant stars at the time of their birth. You can argue against her on the grounds that she’s crazy, of course, but I think we can agree that somebody who reads several horoscopes and chooses one isn’t any more crazy than somebody who reads just one horoscope and then accepts that as legitimate. Your horoscope for this week: you will choose a different zodiac sign and use that, instead. The craziest thing about my ex-, in this particular quirk, though, was that she tried to justify her logic when I challenged it. 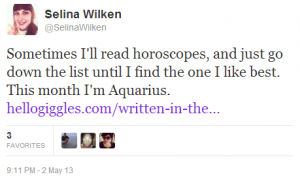 My friend Selina once tweeted that she would select her favourite horoscope from the list of 12 zodiac signs available to her from a single source. I think that’s marginally more-sane again, than my ex-: while my ex- used to read the same star sign from several different media (demonstrating that she harbours a belief in astrology to begin with, but that she finds things made by humans to be flawed), Selina’s actions show that she’s able to take the whole thing with sufficient sarcasm that it almost doesn’t matter. A yet still saner option might be to write one’s own horoscope, rather than funneling yourself into “one of twelve”. It’s still a little bit silly, but at least you’re taking responsibility for your own destiny. Furthermore, writing your own horoscope might be considered akin to an affirmation, which can act as an effective method of self-help. For example, if my ex- were to write her own horoscope, every day, which read “Scorpio: you will no longer read horoscopes nor believe in the power of astrology”, then eventually she might come to fulfil her own prophecy. A not-uncommon Japanese superstition is that your blood type is an indicator of your personality. Which is, I suppose, marginally more-likely to be true than star signs, because at least it could hypothetically have a basis in science. Still wrong, but at least you can see what they were thinking. Many, many years ago, I found a service online that allowed you to change your star sign, for free. You basically filled in a form with your name and your chosen new-star-sign, and it’d give you a certificate that you could print out (or some HTML code to put on your GeoCities page or whatever… did I mention this this was a long time ago). I used the service, and for years afterwards joked that I had never been comfortable in the body of a Capricorn (I mean: financially prudent, pragmatic and mature‽) and was far better suited to my adopted sign of Aquarius (humanitarian, inventive, head-in-the-clouds – sound more like somebody you know). My ex- countered, saying that it wasn’t possible to change one’s star sign, and couldn’t see the hypocrisy of the statement. Recently, somebody using my Free Deed Poll website asked me if they can use a deed poll to change their date of birth (hint: no, and don’t be stupid), and I was reminded of the change-your-star-sign website from so long ago. It’s gone down, now, but I have a half-hearted urge to recreate it. Perhaps for April Fools’ next year, or something. Or maybe I’ll have forgotten about it and moved on to some other crazy idea. Aquarians, eh? This week, the Internet went mildly crazy for a few minutes when people suddenly started discovering that their astrological sign might not have been what they previously thought. My favourite line in the linked article is “…the Minneapolis Star Tribute published an article, stating that our horoscopes are wrong,” to which my first thought was, “Well, duh.” This all comes about because when Ptolemy accidentally invented contemporary astrology, almost two millenia ago, he never specified whether his system should be based on the calendar year, or on the actual relative positions of the stars. While the calendar year has pretty much remained the same since Ptolemy’s time, our solar system has rotationally drifted slightly relative to the rest of the galaxy, and so the constellations aren’t quite in line with the calendar any more. In theory, at least, if we were to plot a sun sign by the stars (as is practiced in some Eastern astrology) rather than by the calendar (as is practiced in most Western astrology), that’d make me not a Capricorn, as you might expect, but a Sagittarius. I had a friend, once, who attached a not-inconsiderable amount of importance to her horoscope. However, she had a strange approach to the subject. I remember one particular morning when she got up and read her horoscope in the newspaper. She didn’t like what she read, and decided that it must therefore be wrong, and instead looked up the one on Teletext instead. Still unsatisfied, she eventually looked up her horoscope on the web, and – finally finding a fortune that she was happy to accept as hers – accepted it. Thankfully, there’s no cause for concern for me, because I’m an Aquarius. I was born a Capricorn, but I never really felt comfortable as one, so I had my star sign changed to one that I felt suited me better. I have a certificate and everything, printed on an old inkjet printer and folded up in a drawer ever since. Once or twice, people have tried to tell me that it doesn’t work; that you can’t just “change” your star sign simply because you want it to be different. When this happens, I simply point out that my bit of paper is just as official, as believable, and as scientific as astrology is in the first place. And despite the (disputed) idea that our star signs might all have changed, as has flooded Facebook, my scrap of paper still says “Aquarius” on it, as relevant today as it always has been!